I love the sight of miniature gourds as they begin to pile up at our local farm stands and always want to buy oodles of them. This year I finally broke down and bought a bunch so we have plenty for creating fun projects with. With Big Brother's inspiration we've already created some gourd pirates, but we also wanted to do something a little more active with our gourds. 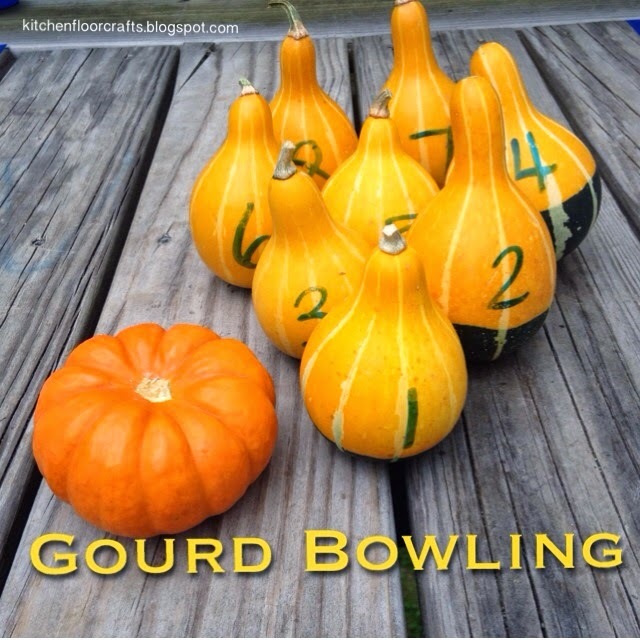 This led us to create Gourd Bowling. We used eight small "pear" gourds and one small "pumpkin" gourd. 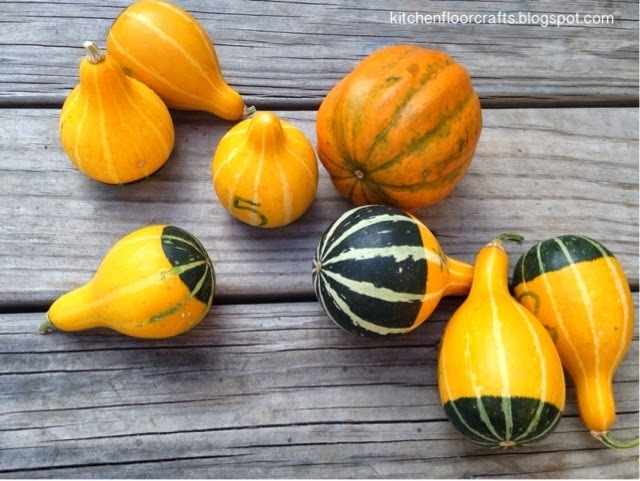 I had planned on using ten pear gourds, but I'll admit I didn't practice standing them up first before buying them. So we only had eight that would easily stand up straight. 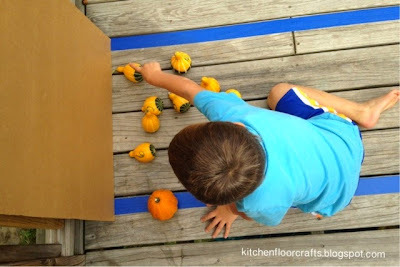 I used dry erase markers to write the numbers onto the gourds from 1 to 8. We also used painters tape to create a bowling lane on the deck. To play the boys stood at one end of the lane and rolled the pumpkin gourd down the lane towards the standing gourds. When it was Big Brother's turn to play, he had a few extra steps to follow. He would first count how many gourds he had knocked down. He would then find the gourd with the number that matched the number knocked over. 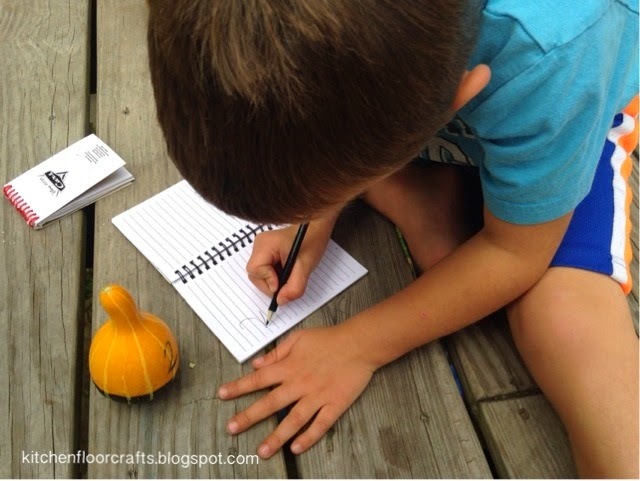 He added in the step of practicing writing the number into one of his notebooks (which he copied off of the gourd.) Although we've done some letter writing practice, it was great to see his own interest in learning to write numbers in an active way. 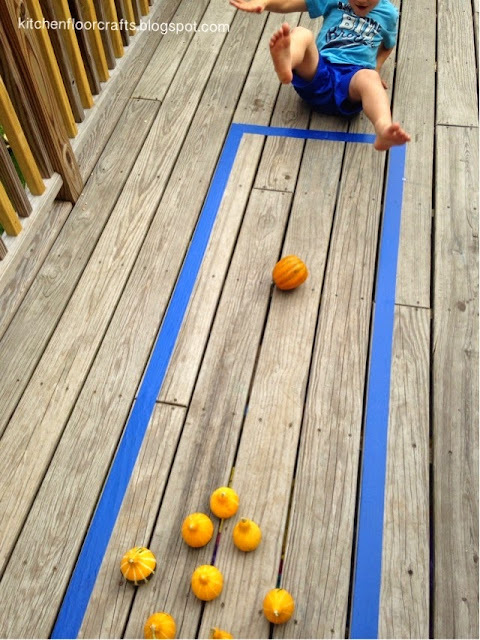 Definitely a fun, active fall game for many to enjoy!